The Ultra-Star is the Official Disc for Ultimate Frisbee®. 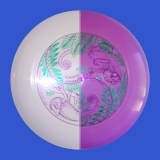 One of the most popular discs we sell! 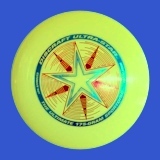 This is the same Ultra-Star as above in glow in the dark plastic. Charge it up and keep playing after dark! The same basic Ultra-Star, but this one starts as a clear disc, then turns purple in the ultraviolet light of the sun!